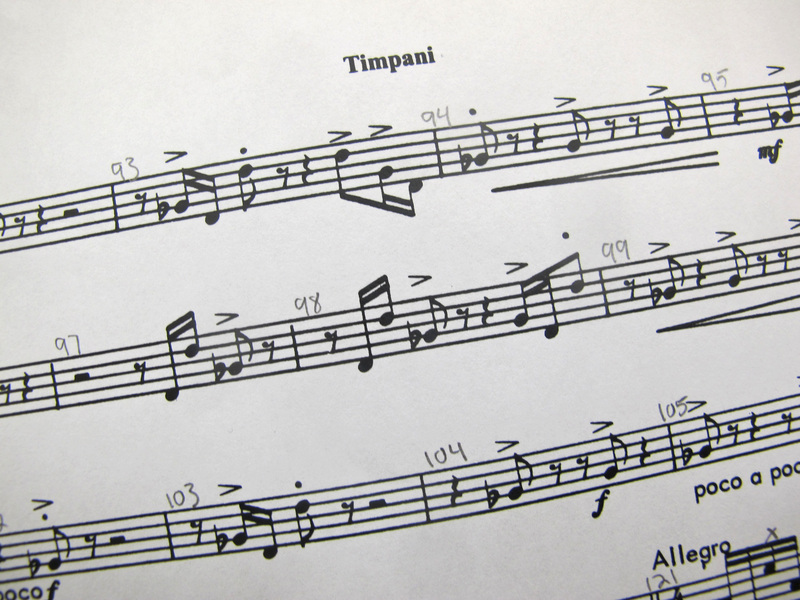 Two sixteenth notes followed by two eighth notes. The interval was a perfect fourth, though I didn’t know that at the time. What I did know, at twelve years old, was that I was hooked on that sound. 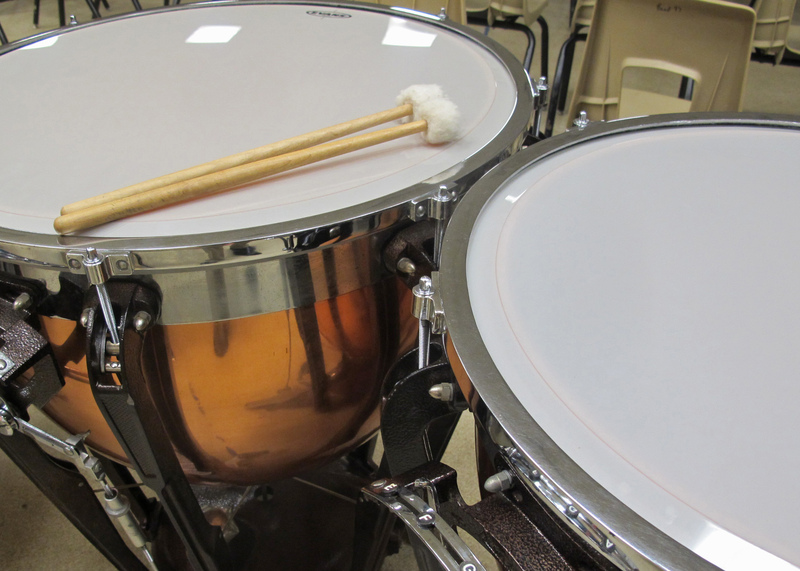 I leaned over to my mother and said, “I want to play those.” I was pointing at the timpani, sometimes called kettledrums. That concert changed the course of my life. There would be other musical high points along the way, like stepping close to a passing high school band during a parade so I could feel the vibrations of the drums against my chest. Later, as a member of that same high school band, I played timpani with a tingling up my spine as our low brass opened up on the First Suite in E-Flat by Holst. What a sound! As a senior in high school with a well-developed defense mechanism against showing any emotion, I stood in an All State Choir rehearsal unable to sing for a few seconds as tears welled up in my eyes. The conductor gave me an understanding glance. I’m sure he’d seen other young musicians with similar reactions when immersed in such beautiful sounds for the first time. Music was where I found everything relevant. It was like a doorway to learning in many areas. In music and the fine arts, I was able to apply learning from other classes in real-world situations. Music teachers provided some individualized learning which allowed me to stay engaged in subjects that I might have otherwise rejected. Music was where I built positive relationships with caring and competent adults. Music was where I formed lasting friendships around collective dedication to shared tasks and goals. I’m thankful that music grabbed my imagination when it did. My fear is that children who need this opportunity today may miss out because of a narrowing curriculum in response to high-stakes accountability. Rather than narrowing, we need to broaden options while deepening the learning and avoiding the temptation of thinking greater standardization will result in higher standards. I’m thankful that my parents took me to that concert when I was twelve and that there was an orchestra to hear. I’m thankful that I found an area I wanted to explore deeply; one which would ignite so many other areas of learning. I’m thankful that I work in a school district that recognizes the value of instrumental music, vocal music, theater, technical theater, dance, and the visual arts. I’ve seen the impact of the fine arts on our children and on the fiber of our community. My hope is that, as we work to equip our children to compete on a national and international stage, we will not narrow the learning in an effort to show better test scores but insist on allowing students to explore the arts and creativity through as many disciplines of learning as possible. We cannot afford to do less! Mr. Wendell Evanson, retired band director at Henderson State University. One of those lasting relationships built around music. Thank you to my school music teachers. I could sit down and visit with any of these individuals like old friends. Rogers Junior High (El Dorado): John Keane and Bob Endel (band) These guys worked with me patiently when I was at my most challenging age. I’m sorry about the firecracker incident…. and the gas heater incident…. and the drum stick/window incident…. and…. El Dorado High School: Hal Cooper (band & music theory) Mr. Cooper made us play a lot better than we deserved to play and he trusted me with some challenging percussion parts. Jim Foxx (choir) Mr. Foxx prepared us well for region choir auditions and made it possible for us to have some great musical experiences. Morris Graham (band) I didn’t have Mr. Graham as director but he gave encouragement to us all. Bob Adams and Dr. Gary Cook (private percussion lessons) Bob Adams taught me drum rudiments and introduced me to George Lawrence Stone’s Stick Control, a book I’d work with for years. I drove to Louisiana Tech each week my senior year for lessons with Dr. Gary Cook. He never worked with me less than an hour even though I was only paying for 30-minute lessons. He also gave me a lot of mallets as we worked together. He was a true musician and master of all things percussion. Wendell Evanson (band and conducting), Mr. Evanson gave us some amazing music. He was relentless in pursuing excellence in all that he did. He was a master with the baton and a great encourager. He seemed to know when you needed a boost. Doug DeMorrow (percussion), Doug worked on my musicianship and was patient with me. As a student, I was his first senior recital at HSU. Doug would later become quite well known for his beautifully crafted DeMorrow marimbas and other keyboard instruments. He’s a master musician and craftsman. John Webb was my supervising teacher when it came time to do student teaching (now called internship). John was a great musician and teacher. He was patient with me as a beginning teacher and encouraged me to build relationships with and learn from great music teachers. He was a person of character, someone I could look up to and try to emulate. Wes Branstine (jazz band and low brass). 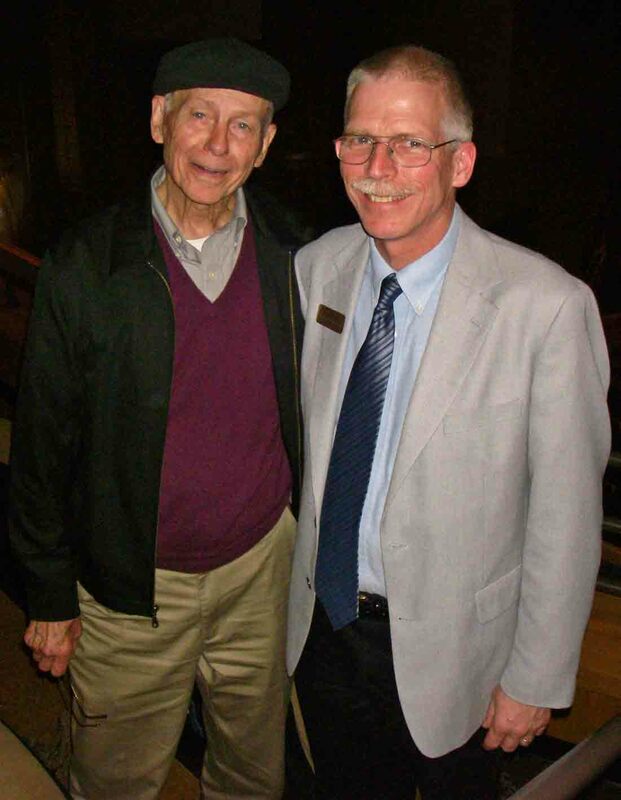 Dr. Branstine gave me private lessons during the summer after I realized I needed help in teaching brass players. He wouldn’t let me pay him. Curiously, I began to have good low brass sections after those lessons. Written for the Arkansas Association of Educational Administrators March newsletter. By ozarkmountainhiker in Uncategorized on February 22, 2014 . Thank you, sir. Thanks for reading. Thanks Russell. Writing it brought back some good memories from our young musician days. This is so beautifully stated, Jim. Thank you! Jim, I so enjoyed reading your article. It is always nice to keep up with a hometown boy. I have retired but am working at Barton one day a week with teachers. Hope to read more of your thought provoking essays. Great Article, Jim and I totally agree! Nice article! Music does change lives daily!! !